IRiSs Lab #7 presents an experiential cinematic experience, utilizing the science and mystery of stroboscopic light theory and the Sufi inspired Dream Machine design patterns of artist Brion Gysin. This revolutionary kaleidoscopic cyclone will involve the live manipulation of projected images through the use of prisms, mirrors, and lenses as well as live sonic interpolations from the audience and the architectural space around them. Images of psychiatric experiments and counter culture recreational activities of the 1960s will float, flutter, and flicker throughout the space as the research technicians monitor their audience test subjects. WARNING: STROBOSCOPIC EFFECTS MAY INDUCE EPILEPTIC SEIZURES IN APPROXIMATELY 1/14000 SUBJECTS. SUBJECTS MAY ALSO EXPERIENCE SOME BENEFITS. Media artists from Sackville, Fredericton, and Halifax will be presenting a very unique performance that merges sight, sound, and improvisation at the Sackville Music Hall on Tuesday July 28, as a part of the OK,Quoi?! Festival of Art. Participating artists include members of the Motion Ensemble, Halifax Musician Lukas Peirce, and local artists Amanda Dawn Christie, and Evan Rensch. IRiSs Lab #4: Tracing Our Trajectories will play with images and sounds relating to themes of movement, transmission, and orbit. IRiSs Lab #3 will build on traces of past lived histories in disappearing architectures, landscapes and the human form within them. "IRiSs" stands for "Integrated Ruptures in Sensory Spaces", and the goal of the IRiSs Lab is to create non-linear improvisational work that abandons the standard, white screen at the front of the black cinematic box, while striving to build site specific work in which projected images and sound interact with the entirety of the architecture and history of the presentation venue. No audience and one observer from the press. 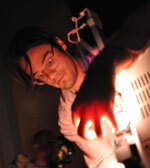 An audio and visual improvisation environment with media artists working with laptops, contact mics, tape loops, film and video projectors, prisms, mirrors, etc. 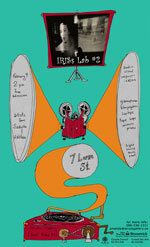 The lab will be followed by a public performance. Participating artists from Halifax and Sackville. support from Struts, Faucet, and AFCOOP. Early labs open jams and free-for-alls.